Patients with Parkinson's disease are treated with levodopa, which is converted into dopamine, a neurotransmitter in the brain. 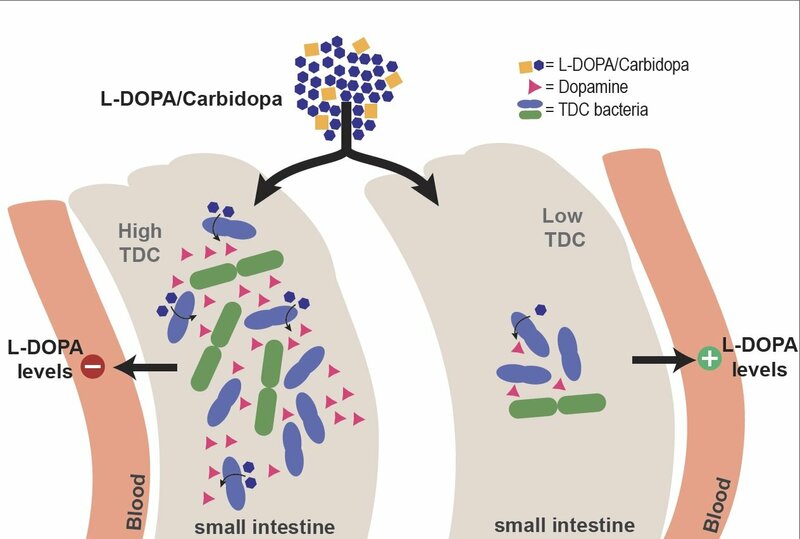 In a study published on 18 January in the journal Nature Communications, scientists from the University of Groningen show that gut bacteria can metabolize levodopa into dopamine. And since dopamine cannot cross the blood-brain barrier, this makes the medication less effective—even in the presence of inhibitors that should prevent the conversion of levodopa. "It is well established that gut bacteria can affect the brain," explains Assistant Professor of Microbiology Sahar El Aidy, lead investigator of the study. "There is a continuous chemical dialogue between gut bacteria and the brain, the so-called gut-brain axis." El Aidy and her team investigated the ability of gut microbiota to influence the bioavailability of levodopa, a drug used in the treatment of Parkinson's disease. The drug is usually taken orally, and levodopa is absorbed in the small intestine and then transported through the bloodstream to the brain. However, decarboxylase enzymes can convert levodopa into dopamine. In contrast to levodopa, dopamine cannot cross the blood-brain barrier, so patients are also given a decarboxylase inhibitor. "But the levels of levodopa that will reach the brain vary strongly among Parkinson's disease patients, and we questioned whether gut microbiota were playing a role in this difference," says El Aidy. In bacterial samples from the small intestines of rats, Ph.D. student Sebastiaan van Kessel found activity of the bacterial tyrosine decarboxylase enzyme, which normally converts tyrosine into tyramine, but was found to also convert levodopa into dopamine. "We then determined that the source of this decarboxylase was Enterococcus bacteria." The researchers also showed that the conversion of levodopa was not inhibited by a high concentration of the amino acid tyrosine, the main substrate of the bacterial tyrosine decarboxylase enzyme. As Parkinson's patients are given a decarboxylase inhibitor, the next step was to test the effect of several human decarboxylase inhibitors on the bacterial enzyme. "It turned out that, for example, the inhibitor Carbidopa is over 10,000 times more potent in inhibiting the human decarboxylase," says El Aidy. 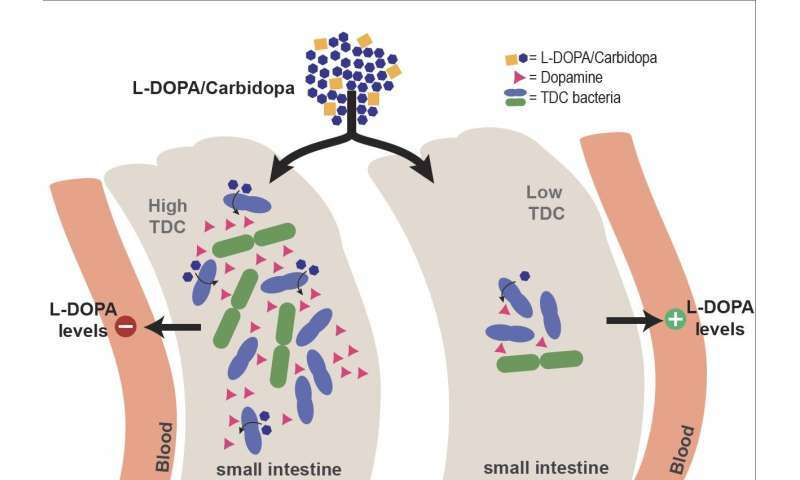 These findings led the team to the hypothesis that the presence of bacterial tyrosine decarboxylase would reduce the bioavailability of levodopa in Parkinson's patients. To confirm this, they tested stool samples from patients who were on a normal or high dose of levodopa. The relative abundance of the bacterial gene encoding for tyrosine decarboxylase correlated with the need for a higher dose of the drug. "As these were stool samples, and the levodopa is absorbed in the small intestine, this was not yet solid proof. However, we confirmed our observation by showing that the higher abundance of bacterial enzyme in the small intestines of rats reduced levels of levodopa in the bloodstream," explains El Aidy. El Aidy concludes that the presence of the bacterial tyrosine decarboxylase enzyme can explain why some patients need more frequent dosages of levodopa to treat their motor fluctuations. "This is considered to be a problem for Parkinson's disease patients, because a higher dose will result in dyskinesia, one of the major side effects of levodopa treatment."